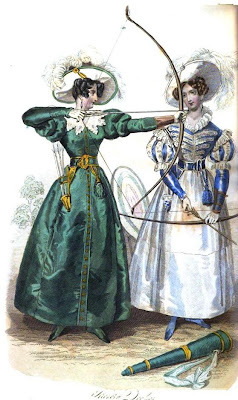 in 1831, archery was a popular pastime for the fashionable and wealthy. The image below shows us what women would wear when trying their hand at this sport. Isn’t that green dress beautiful? I really love that shade of green. 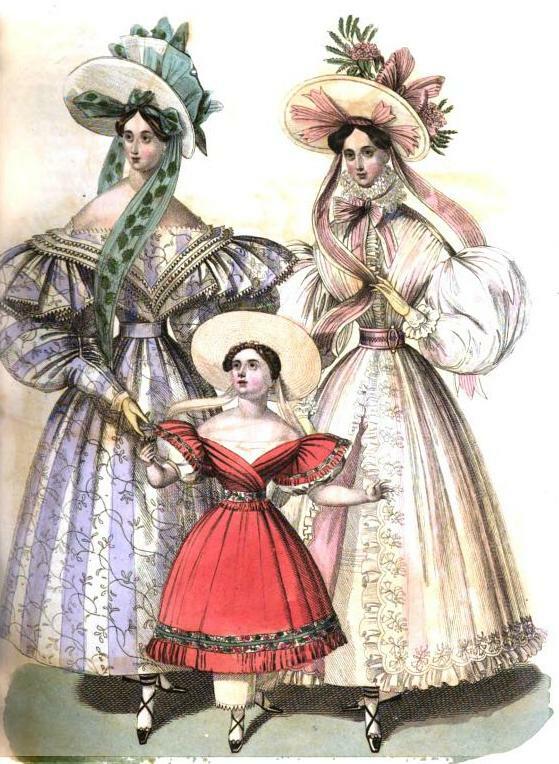 Also, today we will see what every day clothes women would wear in September 1831. I’m not a fan of those style of dresses, but I love the young lady’s dress. Isn’t it adorable? Mustn’t have been too comfortable to wear though. What do you think of these dresses? A dress composed of changeable gros de Naples, green shot with white. The corsage, made nearly, but not quite, up to the throat, fastens in front by a row of gold buttons, which are continued at regular distances from the waist to the bottom of the skirt. The corsage sits close to the shape. The upper part of the sleeve forms a double bouffant, but much smaller than is usually worn. This is a matter of necessity, as the fair archer would otherwise cut it in pieces in drawing her bow. The remainder of the sleeve sits close to the arm. The brace, placed upon the right arm, is of primrose kid to correspond with the gloves. The belt fastens with a gold buckle; on the right side, is a green worsted tassel used to wipe the arrow; a green watered ribbon sustains the petite poche, which holds the arrows on the left side. A lace collar, of the pelerine shape, falls over the upper part of the bust. White gros des Indes hat, with a round and rather large brim, edged with a green rouleau, and turned up by a gold button and loop. A plume of white ostrich feathers is attached by a knot of green ribbon to the front of the crown. The feathers droop in different directions over the brim. The half-boots are of green reps silk, tipped with black. A dress composed of white chaly, with a canezou of blue gros de Naples. The front of the bust is ornamented in the hussar style, with white silk braiding and fancy silk buttons; plain tight back. Long sleeve sitting close to the arm, with a half sleeve, a l’Espagnol, slashed with white figured gros de Naples. A row of rich white silk fringe is brought from the point of each shoulder in front round the back. Collerette of white tulle, of a novel form, fastened in front by a gold and pearl brooch. The belt fastens with a silver buckle curiously wrought; the accessories correspond in colour with the canezou. White gros de Naples hat, ornamented with white ostrich feathers, and a gold button and loop. Half boots of blue kid. A round dress of mousseline de soie, striped in gris-lilas and white, and lightly figured. Corsage en coeur, the coeur formed by a triple lappel edged with pointed silk trimming, which surmounts a very deep single fall, set plain on the bust, and forming full macherons; the triple lappel forms a square pelerine behind. The sleeve is of the Medicis form, but terminating by a small turned-up cuff. The hat is of white crape, ornamented in front of the crown with round coques of green, white, and fawn-coloured tartan gauze ribbon. Two aigrettes of ribbon are placed behind this ornament in different directions. The coques which ornament the inside of the brim, and the brides, are of figured green gauze ribbon. The jewellery worn with this dress should be of or mat. An organdy pelisse, lined with rose de parnasse sarsnet; the corsage is made en demi blouse. The sleeves are excessively wide, and equally so from the elbow nearly to the wrist. They terminate in tight cuffs, trimmed at the upper edge with the material of the dress. The skirt, open in front, is embroidered in detached sprigs round the border, which is lightly scalloped, and edged by a full trimming of the material of the dress. The ruche round the throat is composed of four rows of blond de fil. The bonnet is of the palest shade of straw-coloured moire; it is ornamented with two bouquets of exotics, which are placed in different directions on the crown, with a noeud of striped rose-coloured and white gauze ribbon between them. The ends of ribbon which trim the inside of the brim, and the brides, correspond. The frock is composed of chaly; the colour, a new shade of geranium. The corsage is crossed in drapery before and behind. The ceinture, of a shawl pattern (the small turkish border) to correspond with the trimming of the dress, is edged with geranium-coloured silk fringe. The short loose sleeves are also edged to correspond. The skirt of the usual length, is terminated by two rows of shawl border and a fringe. White cambric pantaloons, and under corsage with beret sleeves; Pamela hat of Italian straw.